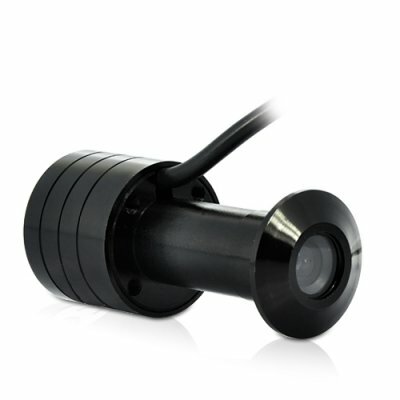 Successfully Added Peephole Security Camera (Hidden Gadget) to your Shopping Cart. PRICE BREAK! This new peep-hole camera gives you an easy way to view and record who is at your door, directly from your TV. Now available at a discounted price you can easily afford. This high quality peephole camera looks just like a standard peephole from the outside of the door. From the inside, you can connect the camera to a DVR or TV and see exactly what’s happening outside your door—all without leaving the comfort of your chair! No one on the outside will suspect that your peephole is any different because there are no wires showing on the outside. Simple in design, but extremely well built, this high quality video camera has a standard peephole sized mid-body that allows you to easily place it within most furnishing including cabinets, doors or ceiling. The high quality lens allows you to view sort range objects with excellent clarity thanks to the 90 degree wide angle lens with 1/3 image sensor. Simply connect the video output cable to your TV or security system then connect the power to any electrical outlet and you now have a 24-hour hidden video security guard! Whether used as a hidden surveillance or as a standard security camera, you cannot go wrong with the CVSH-I112, especially at this below wholesale price. It is in stock right now for single piece or bulk purchases. Order yours today from the leader in factory-direct from China wholesale electronics - Chinavasion! Does this peephole camera monitor audio? No, this device only monitors video.